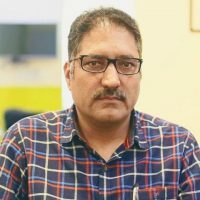 LAHORE: Journalists on Tuesday condemned the killing of Shujaat Bukhari, editor-in-chief of Rising Kashmir, and termed it a great loss for the media fraternity. Staging a demonstration at the Lahore Press Club, they demanded speedy investigation so that killers be identified and punished. They carried placard and chanted slogans “struggle will continue until journalists get freedom”, “attacks on journalists would never be accepted”. Former Federal Minster of Information Pervaiz Rasheed, Journalists including Imtiaz Alam, secretary general, South Asia Free Media Association (SAFMA); Azam Chaudhry, president, Lahore Press Club; Amir Sohail, secretary general, Pakistan Federation of Unions of Journalists (PFUJ); Amir Riaz, Shafqat Khan, Waleed Ahmad and other noted journalists participated in the protest. The use of pallet guns on children should be stopped, said Imtiaz Alam while talking to the protesters. The killers of Shujaat Bukhri must be identified, he said. “Censorship on media in Kashmir is the same as in Pakistan. We can say censorship on media in Pakistan is worse. Censorship in Pakistan is not acceptable while election is approaching in Pakistan,” he said, adding that protests were held in whole of South Asia on Tuesday. “We must be united. Attack on one media person would be considered attack on the whole fraternity of journalists. Journalists should be united regardless of their media groups or media houses. Journalists be united if their articles are not published or their programme are stopped because of pressure from some quarters. Free media is necessary for coming elections in Pakistan. Journalists must struggle for free media, otherwise consequences would be lethal,” he said. Censored media would not play its due role during election. Censored media would affect free and fair election, he said and added Shujaat Bukhari was a key member of SAFMA, who raised his voice for people. He had never bowed before brutal forces. He never compromised on principle of journalism and did not accept any pressure. He stood against the cruelty and set an example of bravery for all. Perviaz Rasheed said freedom and democracy went hand in hand. He said: “Bukhari was our friend because he showed bravery.” He paid tribute to Shujat and said his journey would continue despite that there were many sufferings. “We all are sad after this loss. We will continue the mission of Shujaat, Pervaiz said.